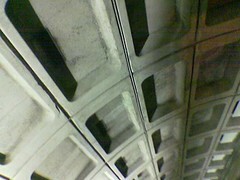 Tunnel walls at Metro Center. On my way home at rush hour. Missed a train due to crowding at doors, center of car was loose and empty.